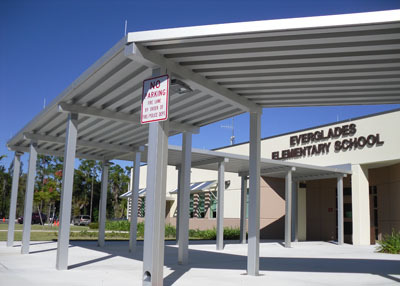 Aluminum awnings and canopies are cost-effective way to help reduce indoor temperatures and to provide energy saving benefits to buildings and structures. You may not often think about how to clean aluminum canopies, but if not properly maintained, they can become dirty and damaged. Make sure to keep trees and debris off of the aluminum structure to avoid damaging the paint or the finish. This can lead to oxidization, similar to rust in iron. Remove as much dirt as possible with just water.You can purchase aluminum solvent to help ease the process of cleaning, or you can use a mild soap to wash off the remaining dirt. Don’t leave any excess cleaning residue on the aluminum and be sure to rinse the aluminum thoroughly. A pressure cleaner is a common tool used to clean aluminum awnings. 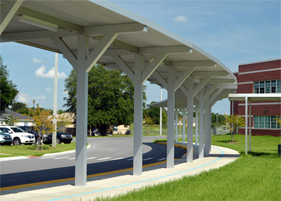 However, care should be taken to avoid damaging the canopy with high pressure. 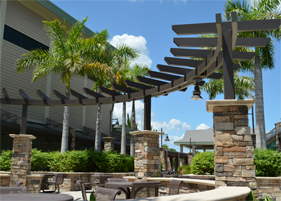 Perfection Architectural Systems provides long-term canopy solutions for commercial projects that will exceed your expectations. 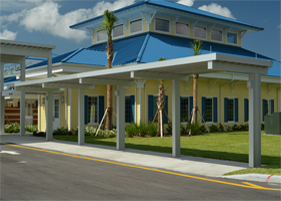 Aluminum solutions can enhance the look of your business while providing you with energy saving benefits. 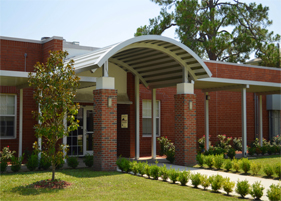 Call us today at 800-238-7207 to learn more about how we can help you construct high quality aluminum awnings and canopies.